I spent the day researching in the Brooks Memorial Library archival holdings of the Wesselhoeft Water Cure, or also known as, the Brattleboro Hydropathic Institution. Founded by German born, Robert Wesselhoeft in 1845, the water-cure attracted hundreds of people from all over the United States, to take part in the restorative water baths and strict diets to cure your ills and make you healthy. Celebrities such as author Harriet Beecher Stowe, poet Henry Wordsworth Longfellow, and even former President Martin Van Buren, took the baths and walked the exercise paths along the Whetstone Brook that meandered through Brattleboro. 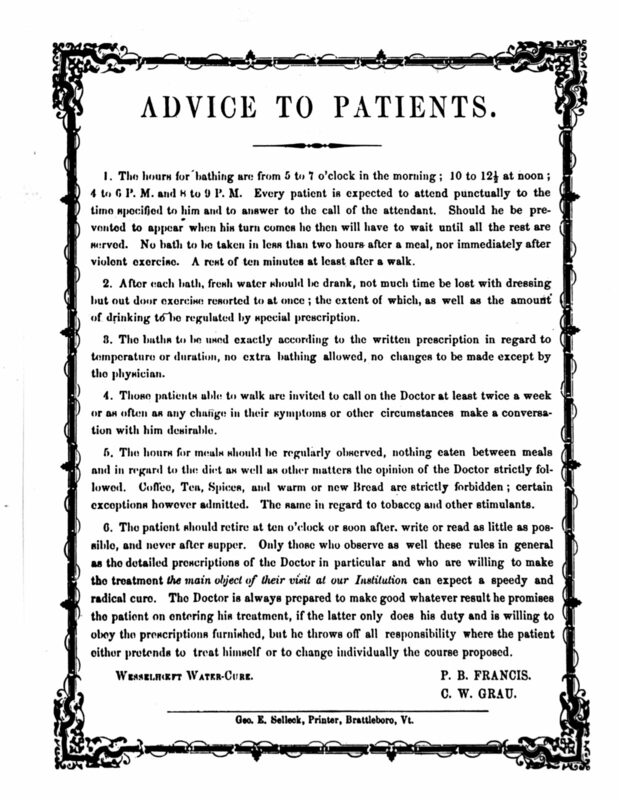 The Green Mountain Spring was published as a monthly journal beginning the spring of 1846 that discussed the diseases being treated at the spa; gave advice on making the most of one’s stay at the institution, and even published the names of guests at the Water-Cure. The journal was published from 1845-1848 and was mailed to subscribers throughout the United States and Europe. Within these pages one can find valuable genealogical information of guest names and their hometown residence. There are over 500 individuals who came to Brattleboro, lived in the community, and took the curative waters of the water-cure. I plan to transcribe these names into a database in the near future. So keep your eye on this blog.